OLYMPIA – Rep. Gerry Pollet, D-46, introduced HB 1860 to require all public schools to test and remove lead contamination in school water across Washington. 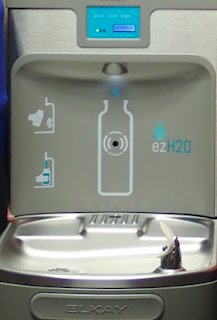 That lead level, found at Green Lake Elementary, is sixty times the maximum level of lead in water recommended by the American Academy of Pediatrics (AAP). They say anything over one ppb (parts per billion) can cause a loss of IQ in children. There are no safe blood lead levels for children according to the AAP. Even low levels of lead exposure harms neurological development and reduces IQ. To protect these school children, Pollet designed HB 1860 to prevent and remove lead contamination from water outlets in Washington’s schools. Most school districts that get their water from public sources do not test for lead in school water. Those that do test for lead may still have outdated standards for what is an acceptable amount. Seattle schools take action at ten ppb, which is still ten times higher than the level of contamination which will cause harm to children’s development. Under HB 1860 all schools in Washington would be required to test for lead in their water at least once in the first three years. After those three years, all schools would be required to hold annual tests for lead contamination. Any school district with lead contamination levels above five ppb would have to prepare a plan of action to prevent elevated lead levels in their water outlets by January 1, 2020. These plans could include installing filters, certified by the National Sanitation Foundation, at all potable water outlets with elevated lead levels. If unable to fix the lead level of an outlet, a school must provide a clean alternative source of water for students. By taking these steps and more to prevent lead in school water, Rep. Pollet hopes to see great improvements in the health and well-being of students throughout the state. “We’ve known the dangers of lead contamination for years. By removing the lead from our schools, we address a major problem and provide a healthier and brighter future for all children,” said Pollet. In 2016 we tested all water fixtures and and replaced and retested any fixture that had a level of 10 parts per billion or higher. North City and Aldercrest were tested to ensure they met the same standard when they came back to use as schools. Our plan has been to test every five years, as recommended by the Department of Health. If the Legislature passes and funds legislation to test and replace more frequently, we would do so. At this point, our next round of testing district-wide would be in 2021. Pollet has been working with Environment Washington and WashPIRG who will soon be releasing a study on lead contamination in school water in Washington. He represents the 46th legislative district which includes Lake Forest Park, Kenmore, and NE Seattle.